Have any of these innovative ideas for products with a strong ‘sustainability’ story crossed your desk lately? 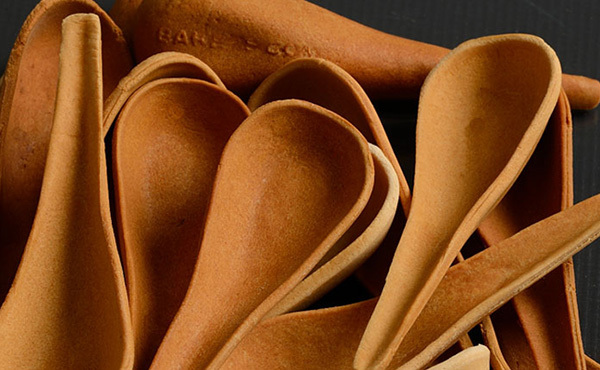 Edible cutlery becoming mainstream just as France is outlawing disposable flatware; shoes that can now be made from carbon emissions or ocean plastic; LEGO is spending $150m to find a sustainable replacement for their signature plastic. 3D Printing, real environmental constraints, and a lot of creativity are coming together to generate a lot of exciting ideas. For Industrial Designers long interested in creating sustained value and not just disposable products, this is great news. But how do you know if something is more sustainable? Whether you do design for an agency or in-house for a manufacturer, you’ve probably been asked at least once to consider the environmental impact of your design decisions. Often, though, that request isn’t backed up with any specifics on what metrics to design to or how to measure them, which is critical for you to incorporate the expectation into your design. Be ready the next time a client or your boss asks the question. Seize the tide of interest growing for products that matter while causing less impact. Follow these five steps to using environmental data to inform your designs. This post is the first of a short series of articles about designing with a consideration for environmental and social impact, aka sustainability. Know the tools at your disposal. Wondering where you’re going to get this data in the first place? There are two major tools on the market now that are incorporating environmental data into the CAD experience directly. There are others: feel free to add your favorites in the comments below. 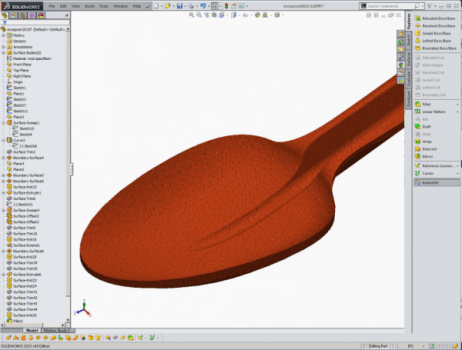 SOLIDWORKS Sustainability, powered by data from GaBi. 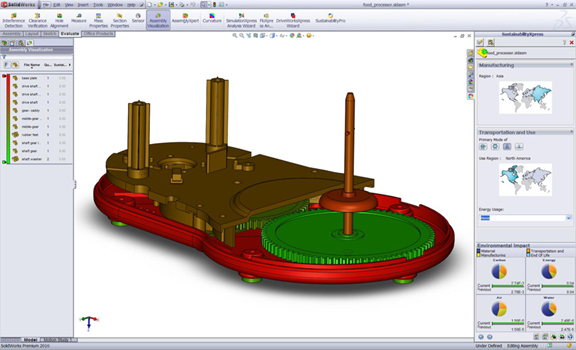 A streamlined version of the functionality, SustainabilityXpress, is built into SOLIDWORKS 2010. Full licenses are available for purchase. Check out this tutorial as an overview of how this tool works. Autodesk EcoMaterials Advisor, powered by data from Granta. This functionality ships with all copies of Autodesk Inventor and applications are targeted at Domestic Appliances, Industrial Machinery, and Automotive & Transportation industries. Check out this tutorial for an overview of this tool in action. Contact us at Design Engine to learn more about whether training on this tool is right for your team. These tools help you evaluate the environmental impact of your design based on primarily the materials selected and their weight. The tools allow you to compare the impact of design scenarios side by side with your evaluation of engineering performance requirements. 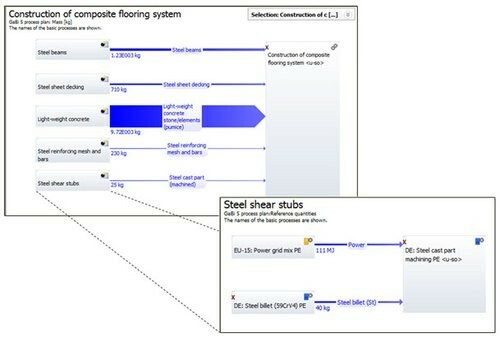 There are also dedicated tools for more sophisticated analyses that go beyond simply the weight and material type, such as thinkstep’s (formerly PE International) GaBi Life Cycle Assessment tool, which is a targeted software that applies the same data used in the SOLIDWORKS, or those focused on a particular industry such as Tally for the built environment. Understand where the data comes from and what it represents. A common question from engineers about this data is its source – if it’s not clear what the data represents, it’s hard to design to it, and you don’t want to be influencing design decisions with something you can’t inherently trust. Life cycle assessment data can come from a variety of sources: direct measurement of a particular company(ies) or operation(s); modeled based on industry expertise of the data developer, or built from review of literature such as patents representing the process flow of a material, operation, or product. How do you know if the data is right for you? Look for representativeness of the appropriate technology, including any regional differences, and in particular always evaluate the age of the data to ensure you’re using best available representation. Environmental impact data from supply chains represents approximations and potentials for impact; it is neither cost effective nor recommended to model empirical data for every step of a supply chain. Your ultimate business objective should influence the level of precision required for the data you use; most applications of environmental impact assessment of supply chains will find best available life cycle assessment data sufficient. A key point to remember – just as environmental data isn’t the only consideration in your design, this data may not tell the complete story that you need to make a final decision. This is where the next step comes in. The SOLIDWORKS and Autodesk tools only measure some impacts that might be of interest to your customers; consumer exposure to chemicals or impacts on people in the supply chain for example would need to be evaluated via other measures. 100% of what you do with this data depends on the company and customer for whom it’s being designed, including both what metrics you should evaluate as well as how to use them to make a decision. Why is this? There is not a universal definition for what makes something ‘sustainable’. There are always tradeoffs between impacts/ benefits and their scale. For example, an increase in the mass of material or energy consumption required in manufacturing might be required to make a more recyclable product, or a completely renewable material might mean risks in the supply chain. It also depends heavily on the business objective driving the request to include this data. Some companies are simply seeking to make sure that there are no major red flags or risks in their product portfolio; others are seeking to be leaders in sustainable design. Get clarity on the business objective of this request before you go further. “Improve brand reputation” isn’t enough – the goal needs to be objective and quantifiable. Align with the end customer – some quick desktop research can help clarify any key concerns from the end customer for lots of product categories. Note, most consumers, even those who claim to be interested in environmentally friendly products, are not compelled by technical or distant benefits. If there’s not a recognized certification/ ecolabel in your space, make sure you’re looking at values and emotions when evaluating this. Remember your Don Normal: the Visceral and Behavioral apply strongly here; only a select few consumers are Reflective about environmental impacts. If information is lacking in all 3 areas, encourage the company to pursue an assessment of what sustainability topics are material for their business. The Global Reporting Initiative (GRI) or the Sustainability Accounting Standards Board (SASB) guidance for materiality are both good places to start. There are lots of consultancies that can help them through this if it’s outside the scope of your role or their skills. Renewable, Recyclable, Recycled Content, Electric-powered are examples of characteristics. You need an actual impact metric to know whether these things are ‘moving the needle’ on the values that are important to you. Impact metrics are things like contribution to global climate change or smog formation, loss of biodiversity, water availability depletion, etc. Whether an attribute produces the reduced impact you desire depends on the specifics of that product or supply chain. Make sure to consider both environmental as well as social metrics, and use impact metrics rather than characteristics as often as possible. Impact metrics, sometimes referred to as indicators, measure the actual physical impact of an activity. Characteristics, sometimes called attributes, are descriptors of a product that are assumed to have certain positive or negative impacts, but sometimes that assumption is incorrect. Hence the need to use impact not attributes when possible. The Global Protocol for Packaging Sustainability provides an overview of key environmental metrics and their meaning. If you take nothing else away from this blog, remember this: you must consider sustainability in the concept phase if you are going to have any chance at a successful sustainable design. This means, don’t wait til you’re done with the design and then decide greater recycled content could be used for the material, or start taking material out to save the cost and impact. Just as with any innovative design, success with sustainable design means thinking differently about the problem you’re working to solve from the very beginning, and going beyond incremental improvement. What does it mean to think about sustainability in the concept phase? It’s easier than you think. As you’re reviewing market research or data, talking to consumers or your own marketing team, or brainstorming ideas, all you have to do is broaden the scope of the ideas you’re considering. You’re just adding a dimension of thinking to your design. What if we made this so it could serve two functions? What if we made it more durable so it could become an heirloom piece? What if we emphasized providing comfort/delight/learning/healthy food/ fill in the blank without requiring the consumer to purchase something? You get the idea. You are probably already thinking like this; once you start calling this broadened thinking ‘sustainability thinking’, many more doors will open for your concept. As I’ve implied, in many ways, sustainability is ultimately a design spec. You know you need certain strength, flexibility, or aesthetic characteristics and you choose the right material that best meets all these objectives. The environmental objective is no different – it’s simply another component to measure. How strongly you should weight the environmental impact when making tradeoffs, and what metric specifically to be trading against, demonstrate the importance of step 3 listed above. So consider the business goals of reducing your impact, include sustainability when you evaluate scenarios on ALL your priority metrics, learn from the outcomes, and iterate. Check out upcoming courses in SOLIDWORKS including our SolidWorks Surfacing Training & Intensive scheduled for October 31st-November 4th, 2016. Laura Flanigan will be speaking about sustainable design at our upcoming Afterburn User Group on October 20th! Click here for details or call 312.226.8339! Laura Flanigan has 15 years of experience defining and creating solutions for business innovation and strategic design to help clients achieve their visions for sustainable products, business practices and operations. Her solutions provide innovative responses to changing market expectations and regulations, enhance brand reputation, develop eco-product claims, and create long-term resilient business models and supply chains.